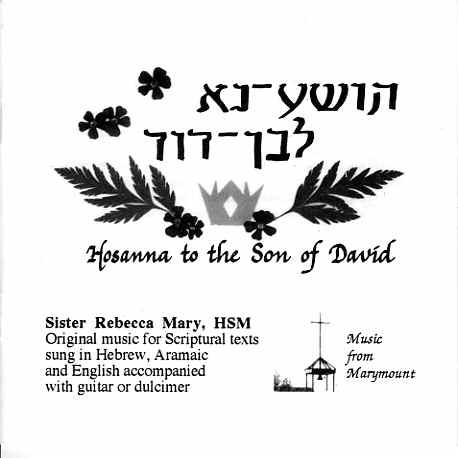 This CD features 21 original musical compositions for Scriptural texts sung in Hebrew, Aramaic and English with guitar or dulcimer accompaniment. Where did these songs come from? They arose out of prayer, Scriptural prayer, daily prayer and prayer before the Blessed Sacrament in chapel. 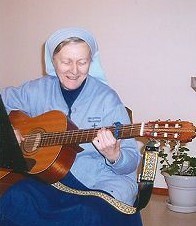 You might call these heart songs, hymns of praise to the Lord arising out of the unceasing prayer of a Hermit Sister. These songs form an intimate part of her sacred dialogue with the Lord. To hear a portion of the CD, click on the Clip links below. Please be patient as the mp3 files are large. If you don't have an audio player, you can download one free called Quicktime. This will work for PCs. When you click below to play a clip, a new window with the player will open and begin downloading the music you have selected. It may take up to a few minutes to download a clip if you are on a dial-up modem. After enough of the song has been downloaded, it will normally start to play automatically. You may use the controls in the playback window to play, rewind, and listen to your selection. When you are finished listening to that clip, be sure to close that audio clip window before you click on the next one you want to hear or your computer may become very slow and unresponsive. To purchase this CD please print our ORDER FORM and fill out the information in the appropriate section.